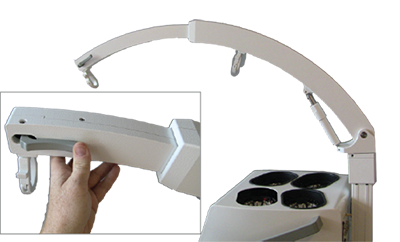 When we started this project, we did not want to simply make another fNIRS system. 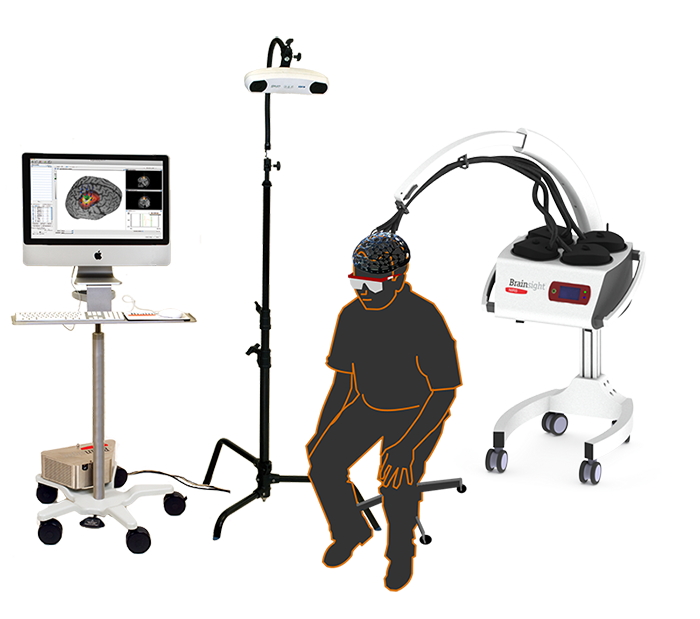 We believe that some of the obstacles hindering wider adoption of fNIRS includes poor compatibilty with complimentary modalities and overall ease of use. We took these to heart when we designed our fNIRS system and came up with a unique system with some unique features. These features are not restricted to the electronics, which of course is extremely important. We took the time to look at current trends in fNIRS as well as at the ergonomics and the overall user experience. We decided to break the system down into the basic components and modularize them to maximize flexibility for the user. The optics are held in 8-channel modules, enabling you to choose a channel count that fits your needs and budget. Each module houses the laser diodes and avalanche photodiodes (APDs). One of the current trends in fNIRS is to acquire data both far from the source (~30mm, to collect the activation data) and proximal to the source (to measure potential signals from the scalp). Instead of sacrificing the sensitive detectors for this, we added a second chain of detectors, specifically for this purpose. Thus, each 8-channel module includes 8 high-sensitivity detectors, plus 4 proximity detectors specifically for recording near the source (where the signal is much stronger). Each module includes 4 dual-wavelength sources. We also added the electronics to support a 3rd wavelength, enabling an easy upgrade inthe future. Our first release was the full 32 channel system. The 32 channel ready enclosure includes 4 bays for up to 4 optical modules. Modules can be swapped out in seconds, so if you want to use different wavelength configurations, or have the flexibility to start with fewer channels and upgrade in the future, the 32 channel-ready enclosure is a good choice. In addition to the modules, the enclosure houses the connections for the 8 auxiliary channels and the embedded acquisition management computer. You will notice the lack of keyboard and large screen. The system is designed to be controlled by the Brainsight computer (via Ethernet connection) so the controller can be next to the subject, or in the next room, reducing the clutter near the subject. The acquisition management computer is designed to work autonomously during the acquisition. The Brainsight computer sets the parameters for the acquisition but the acquisition itself is managed by the on-board computer. The computer can serve multiple clients, so you can simultaneously stream the live fNIRS data to another computer for real time analysis using your own code, or Matlab. 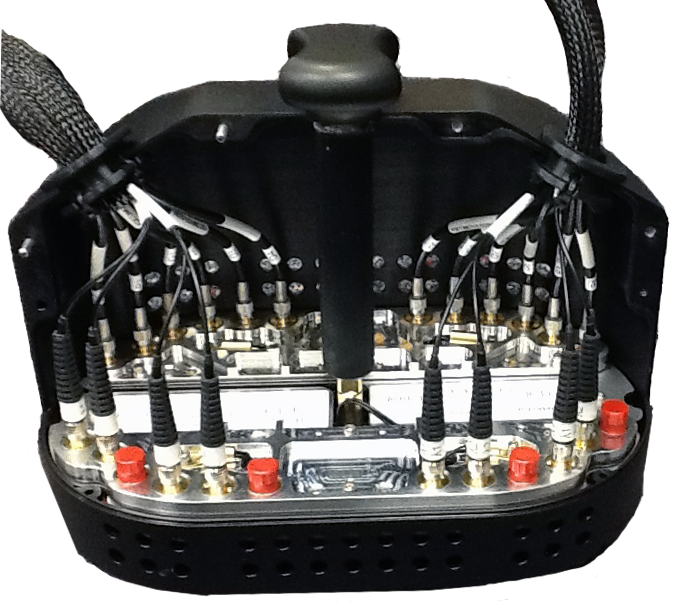 The 8 channel enclosure allows you get started in fNIRS with a lower initial investment. The modularity of the system maximizes future flexibility. You can purchase additional modules to quickly switch from a 2-wavelength to a 3-wavelength configuration, of from short fibres to long fibres. The modules can be used in either the 8 or 32 channel enclosure, so upgrading in the future maximizes your current investment. We noticed that many other manufacturers felt that their job ended when the fibre left the enclosure. Since maintaining good coupling between the optode and head is critical, proper support of the fibres is worth as much as a good amplifier. We took the time to deveop a custom, telescopic arm that is a pleasure to use. It provides stable support for the fibres and is easy to move to the best location. The computer is an Apple iMac with a 27″ retina display on a mobile trolley. 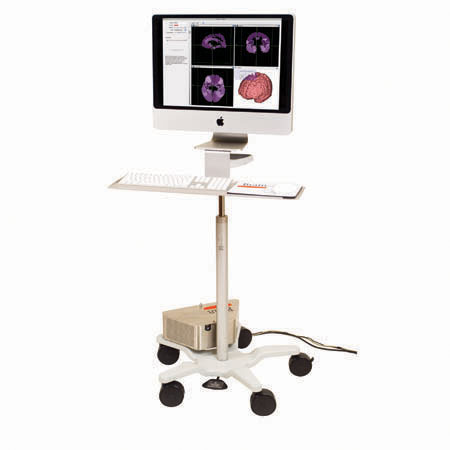 Brainsight communicates with the fNIRS device using a fast Ethernet connection, so the computer can be next to the subject, or in the next room. To digitize the optodes (and track a TMS coil for multi-modality use), we use the industry standard NDI Polaris Vicra position sensor. 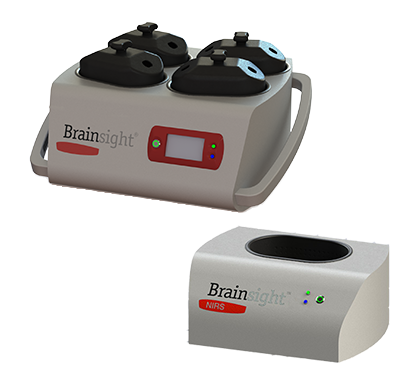 Brainsight automaticlaly stops the IR camera during the fNIRS acquisition to ensure everything works well together.